Let me start off by saying that as someone who sits behind a desk all day eating tofu and searching for pictures of mini dachshunds (this is according to John, of course), I have not experienced many adventures and don’t have nearly as funny or interesting stories as John does; so what I’ve experienced in the last 24 hours has been truly amazing! 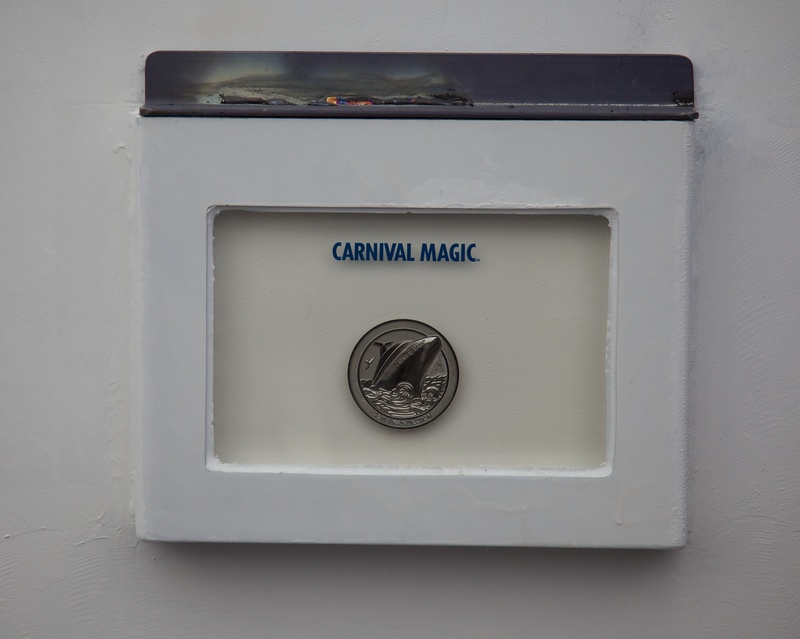 I don’t really know where to start, so will just get to the heart of the story – the Carnival Magic’s coin ceremony. Now, I don’t want to say too much and ruin the video and photos you’ll see on Monday on the blog and on www.carnivalmagic.com, but it was a one-of-a-kind experience. We met so many wonderful staff that all cared so deeply for the ship. I think every single person we spoke with mentioned how the Carnival Magic felt like their baby (Italians are very poetic and passionate, which is really inspiring). Today was a very special day as it’s sort of a baptism for the ship. 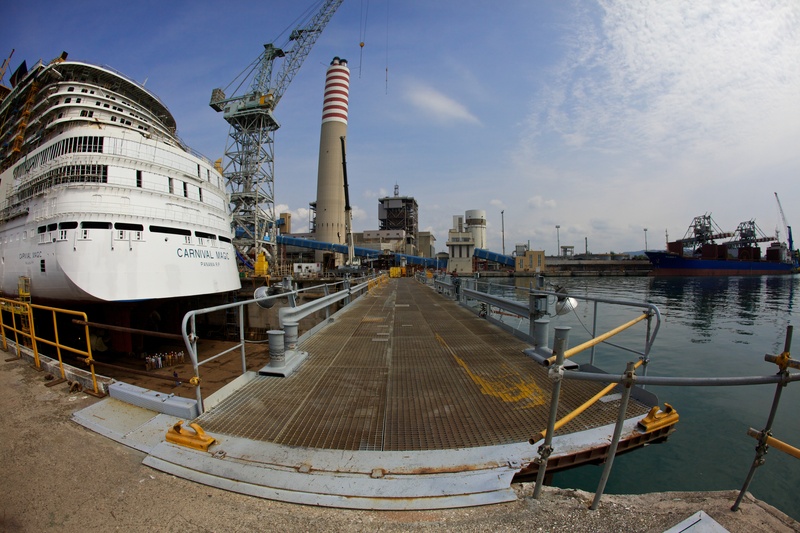 There was a shipyard godmother, who’s worked for Fincantieri for over 30 years. She started working there when she was 15 to help support her family (her father had worked at the shipyard but had passed away). There was a Carnival representative – Mike Julius, managing director of US Sales – on hand to help with some welding (yep, welding…you’ll read more about that in a minute). A priest, the Carnival Magic shipyard project manager and the Fincantieri shipyard director were also all in attendance of this special event. The ship was blessed for safe travels for all crew and guests that will sail with her; a champagne bottle was broken and the ship was gifted with a very special coin. 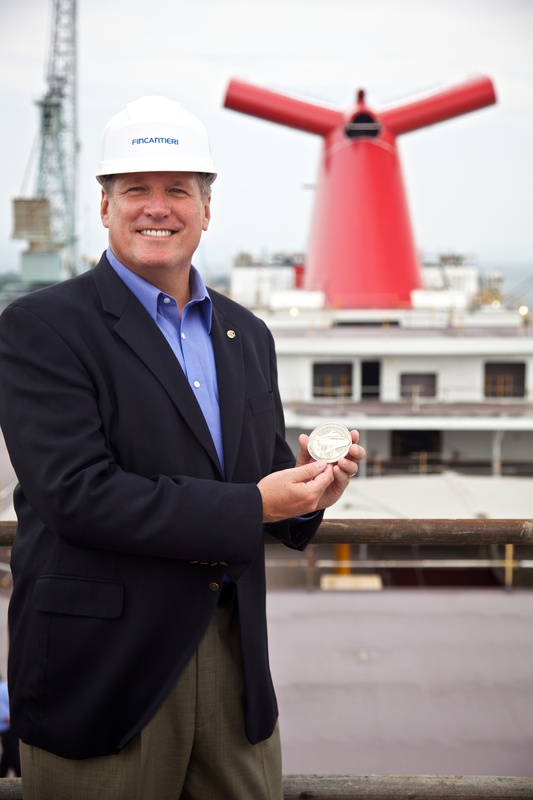 According to the shipyard staff there is a centuries old tradition that calls for every ship to carry a lucky coin. 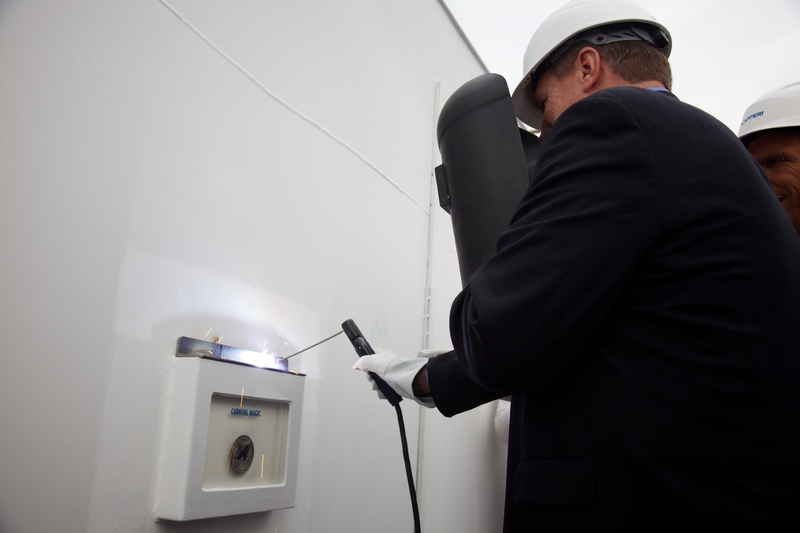 The coin is welded to the hull of the ship and has to happen before the ship can touch water. The flooding of the dock is also a very special occasion as it’s the first time the ship will be in her “natural habitat” as one staff member put it so nicely. Now, I know I didn’t describe it very poetically, but I will tell you that I saw many proud smiling faces – and even a tear or two (happy tears, of course) from both the Italian and American crew and staff during today’s events. 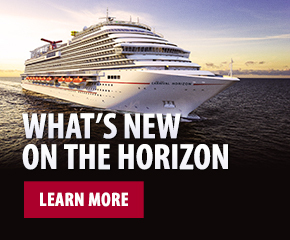 It was an honor to witness the festivities first hand and I will definitely be looking for all the coins on the other ships (the coin is on deck 11 on the Carnival Magic, but I’m not sure where it is on the other ships. Has anyone seen any of the coins on the other ships? If so let me know what deck it’s on). Below are a few photos from Friday’s event. Check back on Monday for a video and more photos. 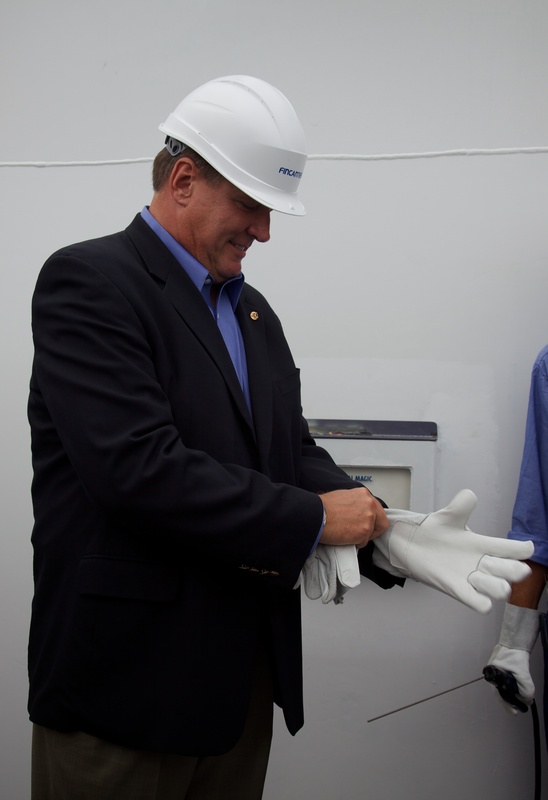 In the meantime I also wanted to take a moment to thank Boris from the Carnival shipbuilding team. Without his help we wouldn’t have been able to attend the event and collect the photos and videos we plan on sharing with you. 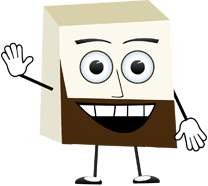 So if you enjoyed learning about the coin ceremony and the ship’s construction process please leave a comment and thank our friend Boris.